There’re two variations of this palette. One is for Light-Medium skin tones and the other for Medium-Dark skin tones. I got the one in Light-Medium. Ok so first of all we talk about packaging everyday, right? Softlight: A finely milled pale yellow shade, which is pretty similar to Anastasia Beverly Hills’ Banana shade. This colour can be used just like ABH Banana shade to set your concealer/cream highlighters under the eyes. I used my Real Technique Setting Brush from the sculpting set to apply this in sweeping motions under the eyes. 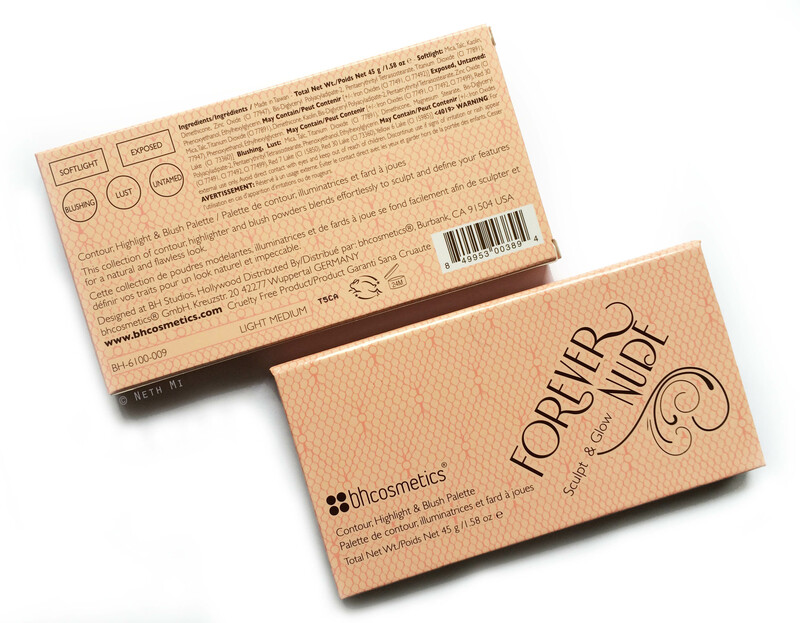 It helped set the concealer and blurred the imperfections around my eye area. This shade gives the right amount of colour without much effort. Exposed: Is the shimmery highlighter shade in the palette. It’s a cool tone champagne pink highlighter, which leans more towards a silvery finish when you apply it on the high points of your cheekbones. This is highly pigmented and super powdery so you have to be careful with your application to avoid too much shine. I used Real Technique Fan Brush from the sculpting set and used a very light hand to gently brush some product on the cheekbones. Blushing: Is a shimmer finish medium rosy-pink blush, but the shimmer isn’t too noticeable when it’s applied. This is very pigmented too, so use a soft fluffy brush that has less density and apply with a light hand. I use the blush brush that came with BH Cosmetics 11pcs polka dot brush set. 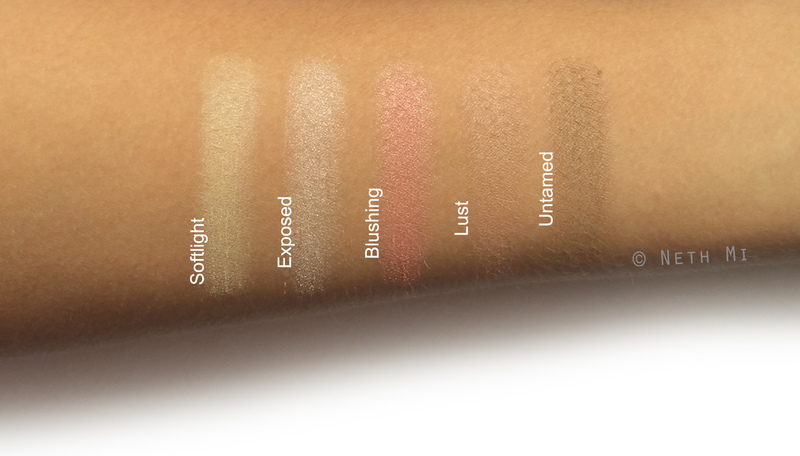 Lust: Is the first contour shade in the palette that has a matte finish. This colour reminds me of MAC’s Harmony blush, which also doubles up as a contour shade for me sometimes. Lust is lighter than MAC’s Harmony, and it’s a neutral contour shade with a hint of rose. This is high in pigmentation too (The entire palette is highly pigmented) so again, you’ll need a soft brush with less density to apply this. Wear time: The blush and contour lasted about 5 hours of running around, doing errands in hot, humid weather but the highlighters lasted about 7-8 hours before fading. Now this is why I said the travel-friendly packaging that fits into your handbag can come in handy, because you might need some touch-ups after lunch or afternoon tea. That being said, my face still looked fresh even without retouching (I didn’t look as lifeless as I look when I wake up in the morning.) Only the blush and contour was less visible by midday. Do I recommend this palette? Yes. 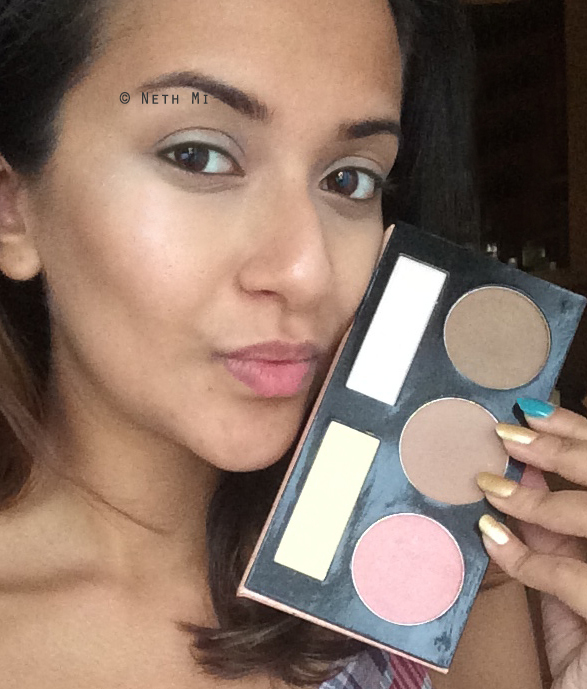 It’s a nice (and very affordable) palette with blush, highlight and contour all-in-one place so it’s quite handy for frequent travellers. It’s also great if you prefer a very natural contour everyday. It’s quite office-appropriate and I recommend it if you’ve just started collecting makeup like me. The price is very attractive too. It’s not a must-have palette, but it certainly is an unsung hero, because when you apply it right, it gives the most gorgeous natural finish to your face.